The Okavango Delta is a year-round Botswana safari destination due to the continual water source. The best time to visit the Okavango really depends on what you want to see. During the rainy season the animal herds are prolific, coupled with the birthing season for most animals. In the dry season - wildlife from the drier parts of Botswana head for the Okavango Delta's waters. Ironically the water levels of the delta rise in the dry season... making this the best time for birding in the Delta. Most people visit the Okavango between April to October because the animals have to remain around the few remaining permanent waterholes, and, reduced foliage increases visibility. By October much of the Okavango has dried out and the channels are narrow. There are however, permanent rivers in Moremi Game Reserve and in the northern reaches of the Okavango. Heat builds up from October onwards and temperatures peak at over 30°C (86°F). It is hot and raining, anytime from November to March. The Delta starts to fill up, and foliage becomes lush and green, resulting in the dispersal of the wildlife all over the countryside, making the game viewing experience more erratic and unpredictable. Not only are animals mor spread out, but long grass and thicker foliage makes them mor difficult to find. This is also the season for new life, and animals mostly give birth at the same time. With the rains, some roads become impassable, even to the point of being partially submerged. This makes driving in some areas a non-starter. Great weather, but game viewing is not so good. Game drives and night drives - offered at most lodges in the Okavango game drives of the most popular choice for visitors to experience the Delta. Night drives provide an opportunity to see the nocturnal wildlife of this fascinating area. Boat Safari - motorboats are used for transporting supplies and for safaris. This is the only mode of transport for lodges in such inaccessible areas. Guided Walking Safaris - there can be no better way of getting closer to nature than on a walking safari with an experienced guide. These walking tours allow you to understand the smaller creatures of the Delta better, with some of the bigger game thrown in too. 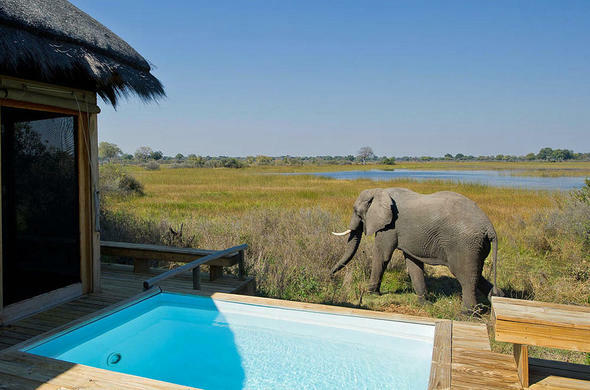 Elephant experiences - the Okavango was the original place chosen for Elephant-back safaris and they continue to this day. There is also a place where close-up encounters with habituated Elephants can be enjoyed.